How much wheat is spice worth? What about olives or cloth, wood or wine? The market determines the value, and while you are but a lowly merchant, with negligible knowledge about how complex economic systems work, you do have the street smarts to know a good deal when you see one; to know when it’s worth spending a bundle and when it’s worth it to let the other people have it. Haggling and trading is your life–why shouldn’t you be the richest merchant in Byzanz? 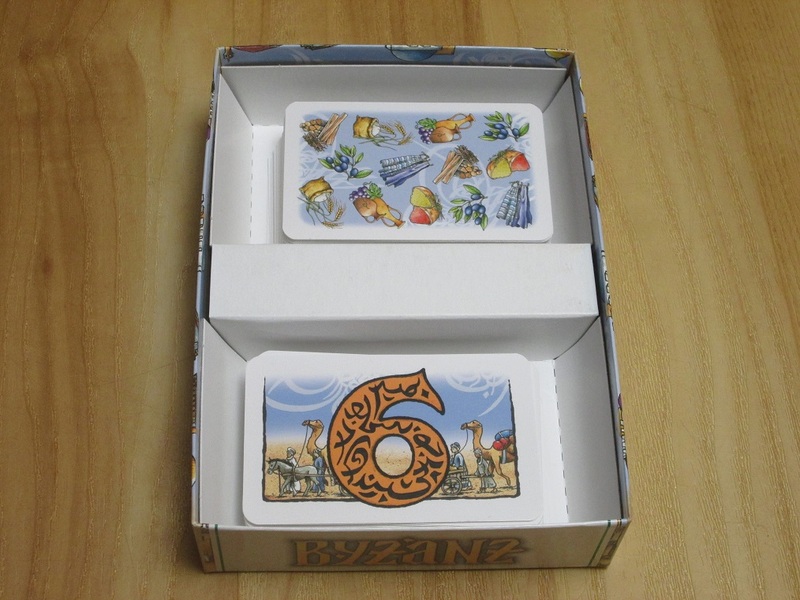 Byzanz is a hand management/set collection card game for three to six players. Players are merchants trading goods trying to amass the biggest profit. The player with the most points wins. Byzanz set up for four players. 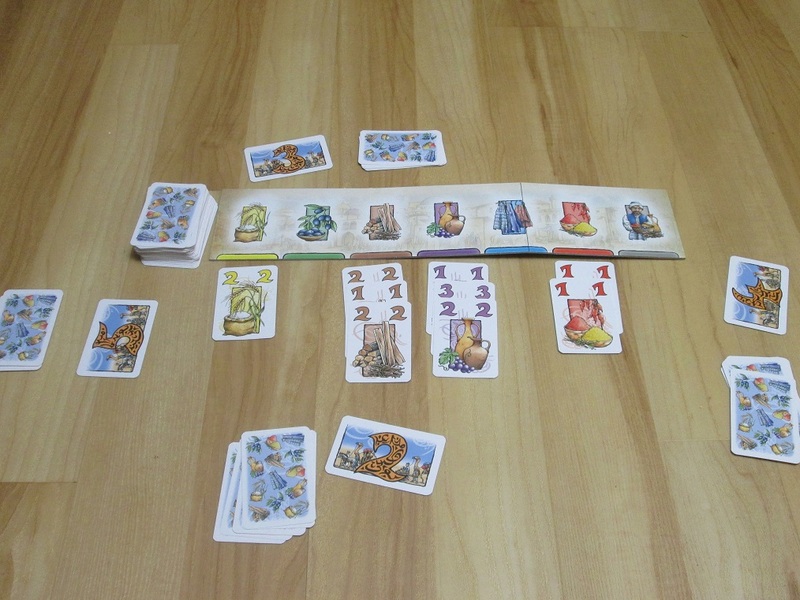 To begin, players place the market board in the center of the table and remove commodity cards according to the player count. The auction cards are set out according to the player count in descending order. Each player is dealt four commodity cards from the deck. The round begins. Each round has a number of auctions, one for each player, and cards are laid out for each auction according to the number on the top auction card. Beginning with the player to the left of the last won auction, players bid using commodity cards from their hand or pass. Each bid must be an increase over the last bid, and players may not exchange bid cards with cards in their hands. After all players but one have passed, the winning player takes the top auction card and places it in front of them. Their winning bid is sorted by commodity and placed in the market. 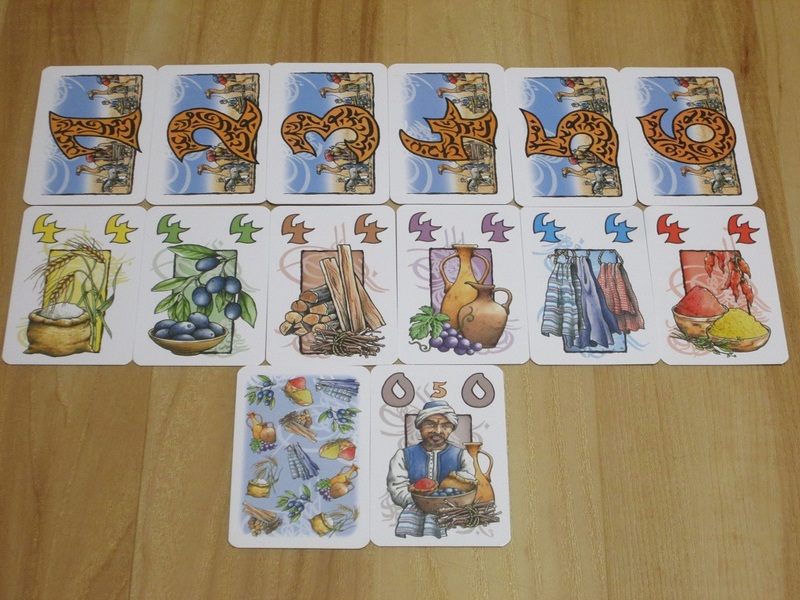 Then the player takes one card from the auction lot and places it in the market, taking the remaining cards into hand. The player winning the bid may not bid in any other auctions this round. Once all players have an auction card in front of them, beginning with the player holding the lowest auction card, each player chooses one type of commodity in the market and takes all cards of that type into hand. 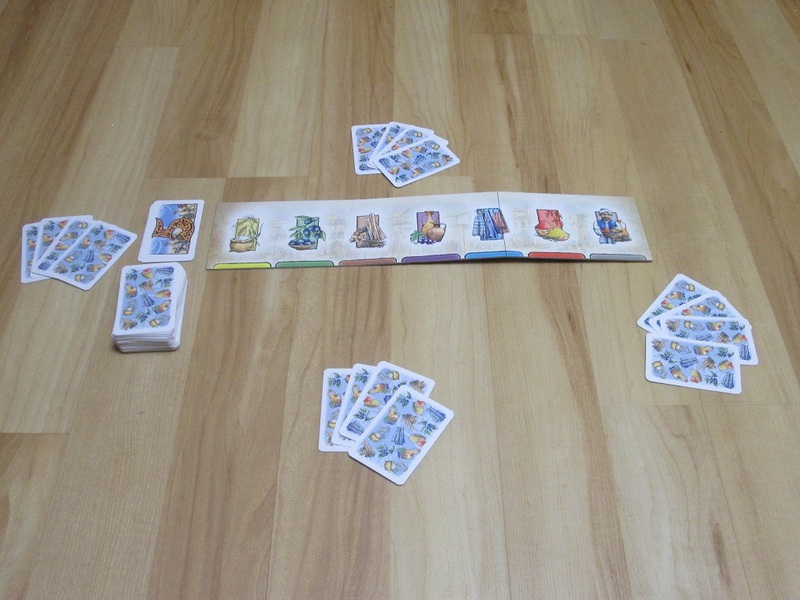 At any time, if a player has more than seven cards in hand, the player must either discard down to seven or sell bundles to get down to seven. Bundles are sets of three of the same commodity. Each commodity has cards valued 1 to 4. When players sell bundles, they take the highest-valued card from the bundle and place it face-down in front of them in a score pile. Merchant cards can be used as wilds (in which case they are worth 0) or sold in a bundle of just merchant cards for 5 points. After all players have taken cards from the market, the auction cards are placed back in descending order, and another round begins. 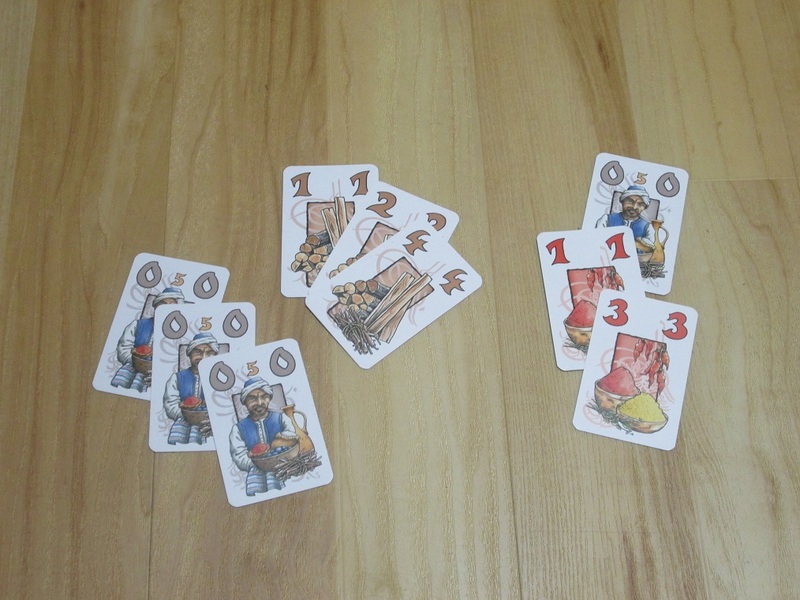 The game ends after a set number of rounds (depending on player count), when the deck of commodity cards runs out. The player with the most points wins. Byzanz is in many ways a blast from the past. When I first received the game, I was a little amazed that it’s coming out now, as Doris Matthäus’s illustrations (a mainstay when I was brought into the hobby) seem to have fallen out of favor, with even Carcassonne getting a recent facelift. When I opened the game and read the rules, it seemed to belong to an older mode of designer Euro games–a few simple, straightforward rules focusing on a clever central mechanism–that has similarly fallen out of favor in recent designs. But we are living in an age of reprints, where everything old is new again, and while Byzanz likely won’t appeal to everyone, it is a clever game worthy of a new lease on life. An auction lot. What am I bid? If I had to boil Byzanz down to one word, it would be just that–clever. Everything in the game is designed around the push and pull of trade-offs. And while these trade-offs aren’t grueling and the game’s rules are very simple, they do imbue the game with interest and keep players invested in what they’re doing. Take the auctions, which offer several trade-offs to players. 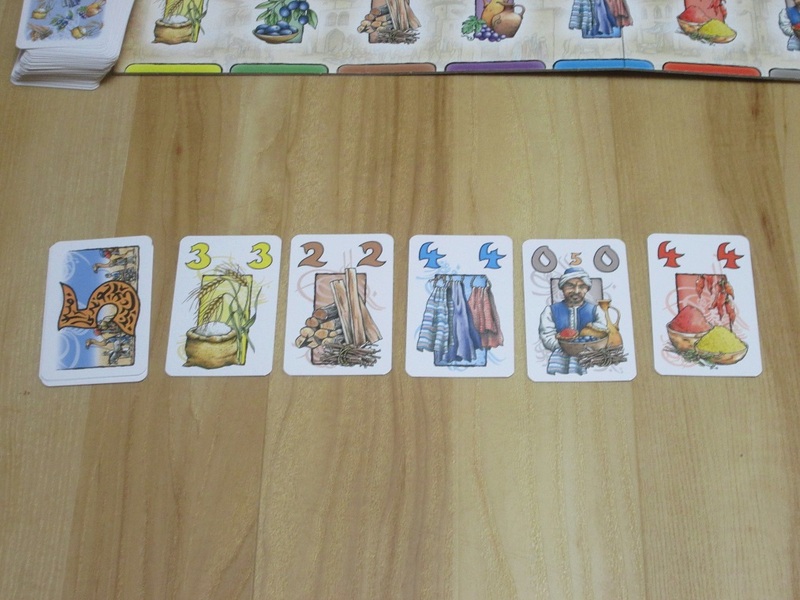 Players bid cards in their hand, which could be used to score points in goods bundles, to win other goods for their hand. Yet in doing so, they also have the trade-off that whatever they bid will end up in the market for another player to pick up. Getting lots of cards in an auction can be great, but the more cards players win in this way, the worse their choices will be when it comes time to get free cards from the market. Players are constantly being pushed and pulled to increase their own fortunes without enabling the fortunes of others. The market. Bids and one card per won auction make their way here, and the player who got the worst auction lot gets first dibs. Clever! But there are more layers to these trade-offs that reveal themselves after more plays. The rules offer an edge case that if no one bids on an auction, the first player to pass wins all the cards and doesn’t have to contribute any to the market. Not only does this have the potential to short the market for players opting to gain cards that way, it also offers an interesting conundrum to the players. The first bidder can put the other players in a bind simply by passing. Even if other players don’t want the goods on offer, there’s a temptation to bid just to keep the first bidder from getting something for nothing. Of course, bidding reduces the attractiveness of the lot for the bidder as the card(s) bid and one card from the lot have to be thrown to the market. It’s possible for the first bidder to pass even if they have interest in the lot simply because of this. Of course, by passing, players ensure that if other players bid anything, even a 1, they won’t have a shot at it later on. Even this is a trade-off. Then there’s the hand management puzzle of the game. Players obviously want to create high-valued bundles, and scoring lots of points is the goal, so it seems at first that selling early and often is the best strategy. However, if a player lacks cards in hand to bid later, it may be impossible to get the necessary cards to sell in future turns. With a strict seven-card hand limit, players are constantly left to puzzle whether it’s better to sell this bundle now or hold off for later; whether it’s worth selling a bundle of, say, 4-3-2 now for four points or whether it’s worth waiting to try to sell two bundles later (a 4-2-1 and a 3-1-1, maybe) to maximize points. And it’s difficult to work on several bundles at the same time. With only seven cards to work with, players have to be quick on their feet to reevaluate their options with each auction lot and trip to the market. Did I mention the game is clever? Goods can be sold at any time in three-card bundles. The highest-valued card is what goes in a player’s score pile. For all its cleverness, Byzanz still manages to clock in consistently under the suggested time estimate of 45 minutes. Even with the upper limit of players, games have lasted just thirty minutes or so, even including the rules explanation. Byzanz offers a good deal of interesting decisions in that short time frame, and it scales well with the number of players. There are just a few things that hold me back from enthusiastically recommending Byzanz, and they’re hard to quantify. The first is the theme. Yes, this is another game of trading in (or near) the Mediterranean, and no, the game does nothing to hide that fact from players or to give it more interest, down to the artwork by Doris Matthäus, who might have invented the frowny Euro dude. Again–don’t misunderstand me: this artwork is fine, and many of my favorite games bear it, and it is almost comforting to me as a fan of classic Euro designs. I’m just saying that this is a Euro-y card game that looks like a Euro-y card game, so it’s not the kind of thing that’s likely to be a crossover hit. The goods cards in Byzanz. They’re nicely illustrated, but I don’t care for the commodity card back. Beyond this, one of the things that keeps Byzanz moving so quickly, beyond the simple rules, is that it doesn’t generate a lot of talk. You’re all sharing a common activity, but there are few truly exciting or devastating moments. This is a tame card game that is tight and clever, but it doesn’t offer many choices that are memorable. There are few gambits that just might pay off, nor are there lots of moments where it looks like another player hit the jackpot or got shafted on a gamble. Players can feel good about what they’ve done–the game, while including luck, is more reliant on player choices–but I doubt it will be the centerpiece of a memory or a game that players will discuss much after the game is over. It’s consistently enjoyable–more than can be said about many games–but it’s also a little forgettable. I suspect that it will elicit neither boos nor cheers from most audiences, and while there’s something to be said for that, that may not be endorsement enough in these days of board game glut. 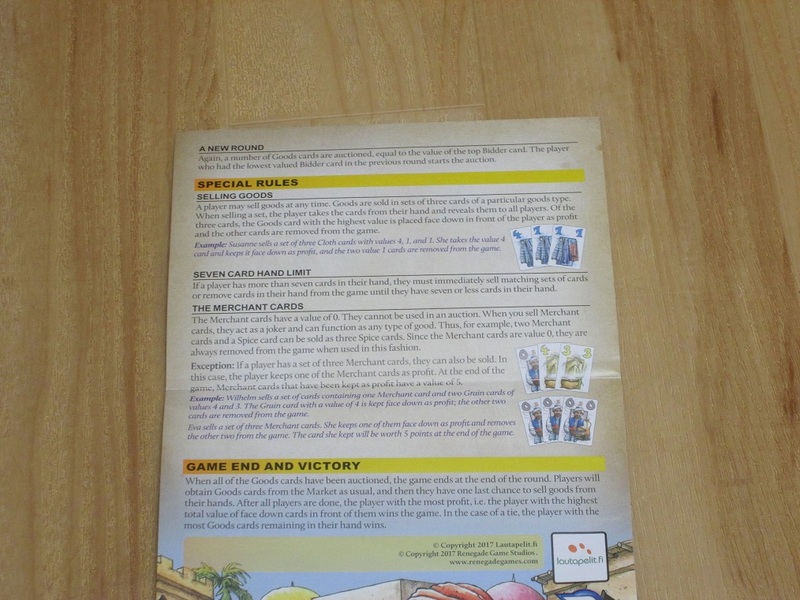 The rules leaflet is easy to follow, and the rules to the game are simple. Very nice. What you get in the Byzanz box is nice. There’s a market board that displays where each commodity goes, the commodities are well illustrated, and the color and font on each card are bold and clear. The cards don’t have a linen finish, but they don’t feel cheap; they are nice cards that should stand up to some abuse. The included rules are slender and very clear–I was able to teach the game with minimal lookups after one quick read, and when I checked the rules afterward for mistakes, I found I had taught them perfectly. I have just two small complaints about the components. First, the illustration on the commodity card backs is…uninspired. It’s smaller pictures of the commodities arranged without much pattern just so they cover the white space. The game gives you enough to think about that you probably won’t be concentrating on card backs anyway, so this prevents them from becoming irksome. But they don’t do anything to detract from the criticism of blandness. And second, the box is larger than I would like. I noticed that older editions of Byzanz came in the standard small-box format (think Coloretto or No Thanks! ), which would have been perfect. This edition comes in a larger box, which while not large, takes up more space on the shelf than I would like. That being said, older editions lacked the market board, which is a handy addition. For me, I’d trade the market board in a heartbeat for a pocket-sized box, but others might disagree. These are quibbles. The game is solid, and the price is right for what you get. The insert. There’s a good deal of space leftover in this box. (Not pictured: folding market board.) The box is around the size of the Exit series from Kosmos. Byzanz is a quick, simple, yet very clever Euro card game that will likely satisfy, if not excite, fans of classic Euro games. Its appeal might not reach to players who rely on theme for fun, but I think it’s clever enough that most people who sit down with it will have a good time. This isn’t likely to form the centerpiece of a game night, and it isn’t meant to. For what it is–a small card game, in both size and duration–Byzanz delivers the goods. 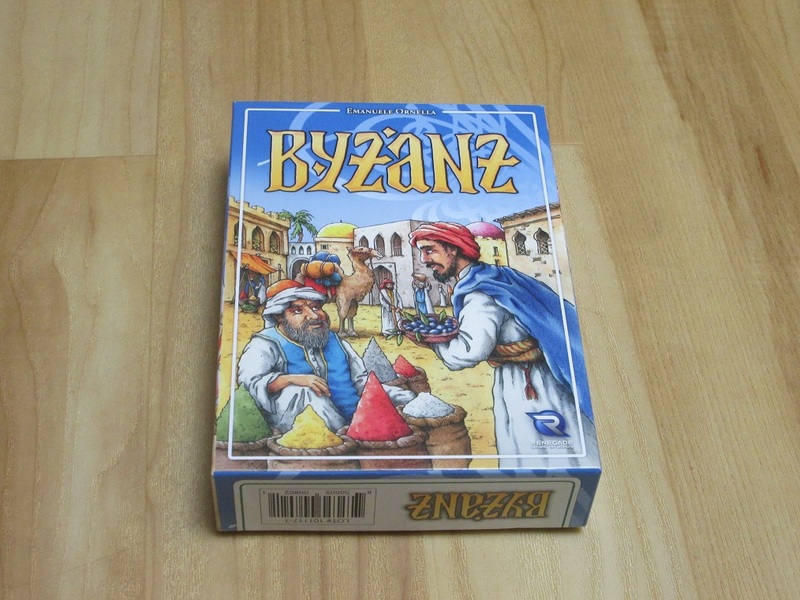 iSlaytheDragon would like to thank Renegade Game Studios for providing us with a copy of Byzanz for review.